TORONTO — As Saudi Arabia continues to escalate its political dispute with Canada, experts say Canadian businesses shouldn't expect any quick resolution. On Tuesday the loonie dipped following a report that Saudi Arabia had directed asset managers to sell off Canadian holdings. 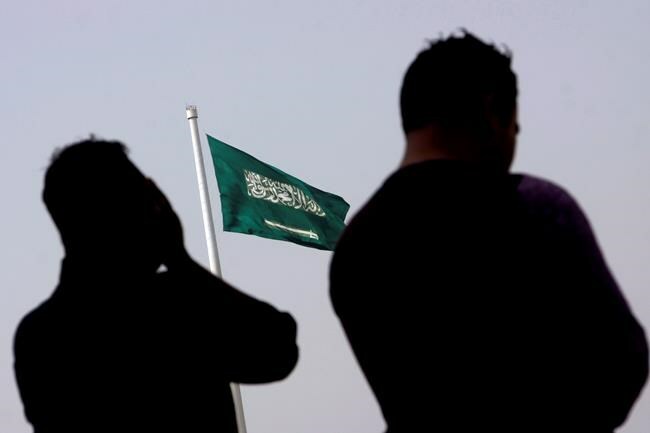 The Saudi central bank and state pension funds have sent instructions to dispose of Canadian equities, bond, and cash "no matter the cost," the Financial Times said, citing unnamed sources. "The biggest effect it had immediately this morning was the Canadian dollar did take a drop, it fell about half a per cent today," said Michael Currie, vice-president and investment analyst at TD Wealth. "It's strengthened since then, but I think a lot of that was a report on the Saudi central bank and pension funds are selling stocks, selling a lot of assets," he said. Saudi Arabia is estimated to hold between about $10 billion and $25 billion in Canadian currency, said Currie. The report came a day after the Toronto Stock Market saw a major selloff from an unknown international dealer, in contrast to gains in other global markets, said Dominique Barker, portfolio manager, CIBC Asset Management. The equities selloff came after Canada's Global Affairs Ministry expressed concern about the arrest and detention of a female blogger and activist in Saudi Arabia, prompting the kingdom to respond forcefully. Saudi Arabia has declared a freeze on new trade with Canada, recalled thousands of students attending Canadian universities, ordered Canada's ambassador to leave the country, said it would pull all Saudi patients from Canadian hospitals, and suspend Canadian operations at their national airline starting Aug. 13. Canadian grain exports to the country have also been hit, said Cam Dahl, president of industry group Cereals Canada. "We do have notification from the Saudi grains organization that future contracts, they're not going to be from Canada." He said about seven per cent of Canada's barley crop goes to Saudi Arabia, while a much smaller share of wheat goes there. The strong response from Saudi Arabia comes after the country was frustrated by debate in Canada on a $15-billion contract on light armoured vehicles with the kingdom and a lack of attention to business relations, said Janice Stein, founding director at the Munk School of Global Affairs. "They expect attention to the relationship. From their perspective, public criticism of their human rights record is not consistent with developing a relationship with them." The reaction by Saudi Arabia under the leadership of Crown Prince Mohammed bin Salman has echoes of other strong and impulsive reactions to national disputes, said Stein. "This is an all-out broadside of the kind they launched against Qatar." In the case of Qatar, Saudi Arabia under bin Salman pushed neighbouring countries to join it in a blockade of the country. The episode shows he is not one to back down quickly, said Stein. "He has not backed down, even though he has hit rough water, the campaign against Qatar has not really broken." Eurasia Group analyst Ayham Kamel said in a research note this week that the dispute is part of Saudi Arabia asserting it will no longer play by old rules, will no longer ignore criticism. He said Saudi Arabia could exert further pressure and also doesn't seek a quick resolution. "Saudi Arabia and Canada are unlikely to quickly resolve the crisis. While Riyadh has not used all the economic levers at its disposal, it has signalled its willingness to adopt additional measures." The kingdom's actions against Canada has also raised concerns about how it might affect operations for Canadian companies in the region, including SNC-Lavalin, which has a sizable presence in the country. The company said in a statement to The Canadian Press Tuesday that it values its relationship with the country, but has refused further comment on whether it expects any impacts from the disagreement. Barrick Gold, which has a joint venture with Saudi state-owned Saudi Arabian Mining Co. on a copper mine in the country, said in an emailed statement that it expects the partnership to continue to deepen over time. Global Affairs Canada spokeswoman Allison Lewis said Canada was seeking clarity from the Government of Saudi Arabia on various issues. "The embassy's trade officers in addition to the wider trade commissioner service are actively engaged with Canadian business interests and will continue to work with them and the relevant authorities in the coming days," said Lewis. The targeting of business and financial impacts in response to criticism means Canada will have to have a debate on the costs of voicing human rights criticism going forward, said Stein. "We're moving into a world where nothing is free."